Highlights – Inland Ridgeway Walking and then the full length of the serene and peaceful Fleet lagoon before crossing the causeway to imposing Portland Island. A morning climb through scrub and woodland leads to open, rolling fields and a fine minor ridgeway over the small summits of Linton and Merry Hill. 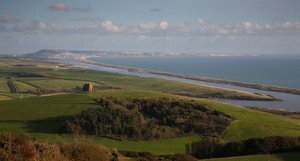 The whole way the South West Coast Path offers superb vistas across the east end of Chesil beach and the imposing looking Isle of Portland ahead. After some pleasant woodland descents from the ridge you rejoin the coast and reach the focus of the days walk, The Fleet. 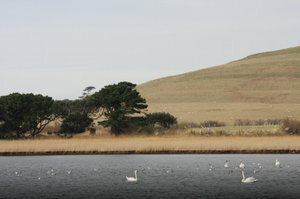 The largest inland saltwater lagoon in the UK, The Fleet is hemmed in from the ocean by the ever moving barrier of Chesil Bank (Fleet comes from the Saxon word ‘fleot’ meaning shallow water). The coast path faithfully follows the lagoon edge gently tracking in and out of picturesque bays holding dragged up boats, past tranquil willow beds and looping peninsulas. Its an absolute joy to walk the calming blue waters of The Fleet and happen across the hidden hamlets and villages en route along this unique section of the Dorset Coast Path. There is a huge variety of wading birds on the waterside, Curlew, Dunlin, Ringed Plover and Redshank mix with exotic Little Egret, Oystercatcher and Heron. Visiting migratory birds such as the Brent Geese are attracted by the rare meadows of eelgrass and Thrift locally known as Sea Pink, indeed Fleet is the second oldest nature reserve in the UK protected since 1393 on account of its swans. More easy walking over small creek crossings and bays dotted with isolated fisherman’s huts bring you to Chickerall where you pass the Army Camp and firing range (The Fleet was one of the locations used for testing of the legendry bouncing bomb as it happens). The guard in the sentry box will divert you inland on a short detour if the army are on training amongst the yellow gorse covered shore.